Michigan and Michigan State both dropped in The Associated Press' latest Top 25 poll this week . The Wolverines (20-2, 9-2 Big Ten) fell two spots to No. 7 after splitting the week with a 65-49 home win over Ohio State on Tuesday followed by a 74-59 road loss to Iowa on Friday . The Spartans (18-4, 9-2), meanwhile, dropped three spots to No. 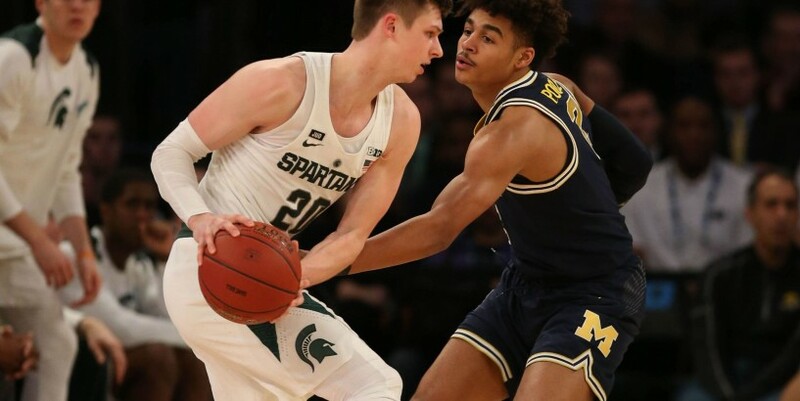 9 after an overtime home loss to Indiana (79-75) on Saturday in East Lansing . With losses from both Michigan and Michigan State, the Wolverines and Spartans are now tied atop the Big Ten standings with No. 15 Purdue (16-6, 9-2). Tennessee remained the top team in the country, followed by Duke, Virginia, Gonzaga and Kentucky. Nevada is sixth, North Carolina is eighth and Maruqette rounds out the top 10. Ranking, school, first-place votes in parentheses, record; 1. Tennessee (48), 20-1 2. Duke (12), 19-2 3. Virginia (4), 20-1 4. Gonzaga, 21-2 5. Kentucky, 18-3 6. Nevada, 21-1 7. Michigan, 20-2 8. North Carolina, 17-4 9. Michigan State, 18-4 10. Marquette, 19-3 11. Virginia Tech, 18-3 12. Houston, 21-1 13. Kansas, 17-5 14. Villanova, 18-4 15. Purdue, 16-6 16. Louisville, 16-6 17. Iowa State, 17-5 18. Texas Tech, 17-5 19. Wisconsin, 16-6 20. Iowa, 17-5 21. LSU, 17-4 22. Florida State, 16-5 23. Buffalo, 19-3 24. Maryland, 17-6 25. Cincinnati, 19-3. Contact Nick Baumgardner at nbaumgardn@freepress.com . Follow him on Twitter @nickbaumgardner . Read more on the Michigan Wolverines and sign up for our Wolverines newsletter .